Desire to Decorate: Delicious! Delicious! Delicious! "can we make a vanilla cake?" "it looks like peanut butter!" "who's going to have pumpkin cupcakes?" "why are we making a vanilla cake, it's not my birthday"
Oh, we also bought our halloween candy and got up some indoor decorations... overall a great family weekend! Well done! You are so ambitious- I was happy to get curtains up in my room over the weekend (actually took us a long time- see blog:) I also ventured to the Halloween store, which was pure chaos but I digress... Your little guy is adorable! Pumpkin cakes and pulled pork? Your house must have smelled heavenly! Looks like you had a great helper there. That's adorable, Wendy. The pics of your little guy are so cute! Sounds like one big productive day of deliciousness! Awww, that looks like so much fun! 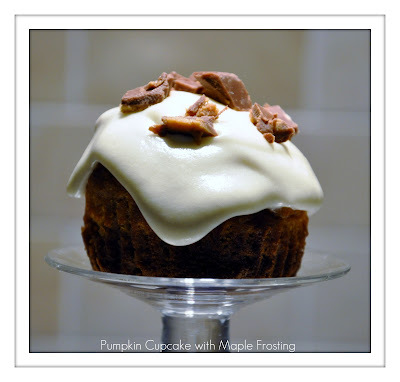 Want to make some pumpkin cupcakes for our get together next Saturday?? Ha ha. ooo boy, these sound sooo delicious!! p.s. I know what you mean about winter! I know our snow won't stick around but it reminds me of what's in store! arg. Sorry I didn't post earlier, but the yummies you brought in were gone in seconds! Unfortunately for me, I didn't get to taste any... but the buzz around the office was "Who made these delicious cupcakes?"! Although I did get to taste some of your cream cheese icing (some fell onto your empty tray)... simply d-e-l-i-c-i-o-u-s.